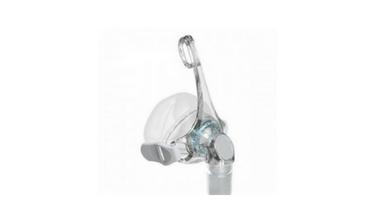 The Eson 2 Nasal CPAP Mask Assembly Kit, he Eson 2 Nasal CPAP Mask Assembly Kit is the mask without headgear. The headgear may be purchased separatel;F&P's original Eson Nasal Mask is known for its RollFit seal. The adaptive design glides over the bridge of the nose to accommodate changes in sleep position throughout the night. With attention to helping maintain a strong seal regardless of motion, the mask is intended to prevent leaks and nasal sores. The Eson 2 Nasal Mask also covers less surface than the original design, which was already considered slim. The frame's ease of motion and a secure fit are further advantages of the RollFit technology. The full motion elbow moves in 360 degrees, potentially decreasing issues such as mask drag. In addition, a small, grey diffuser is found on the top of the mask elbow. The fibrous fabric is eco-friendly and serves to quiet the device as air releases from the mask. This part is replaceable and can be changed out to aid the longevity of the Eson 2 nasal mask.